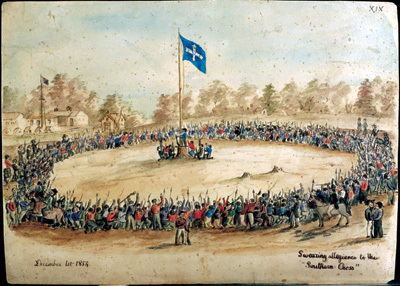 The flag of the Ballaarat Reform League, the Southern Cross, now more commonly known as the Eureka flag, was first flown at a Monster Meeting of around 12,000 men held on 29th November 1854 at Bakery Hill. The meeting was called to hear the results of the Ballaarat Reform League's deputation to Governor Hotham. The anger of the meeting when they heard of Governor Hotham's dismissal of their Charter led to a call to burn mining licences. Through the generosity of the descendants of John King, the Eureka flag was given to the Art Gallery of Ballarat in 2001. The flag had been on loan to the Gallery since 1895 when John King's widow was approached by the Gallery Association at the instigation of Gallery President, James Oddie. Original flags are a rarity - they seldom survive the battles where they have been flown or, as in the case of the Eureka flag, the many years before their significance is recognised. John King had been a police trooper at the storming of the Stockade. He had volunteered to 'capture' the flag, climbing the flagpole and tearing the flag from its mast to do so. The flag was then used as evidence in the treason trials in early 1855. It is believed that when no-one claimed the flag after the trials it was returned to John King, who was by now a farmer having left the police force soon after Eureka. The King family treasured the flag for over 40 years before James Oddie learnt of its survival. The loan continued until 2001 when the descendants were approached by the Gallery Director to formally and legally gift the flag to the Gallery. Interest in Eureka and the flag had increased to a point where there were at that time a number of individuals and institutions showing interest in claiming the flag. The flag had survived 147 years due to the care of the King family and the Art Gallery of Ballarat. It was time to formalise the ownership. This paper will examine the meanings of the Eureka Flag, which was first raised at a huge public protest meeting at Bakery Hill on the Ballarat goldfields on 29 November 1854. 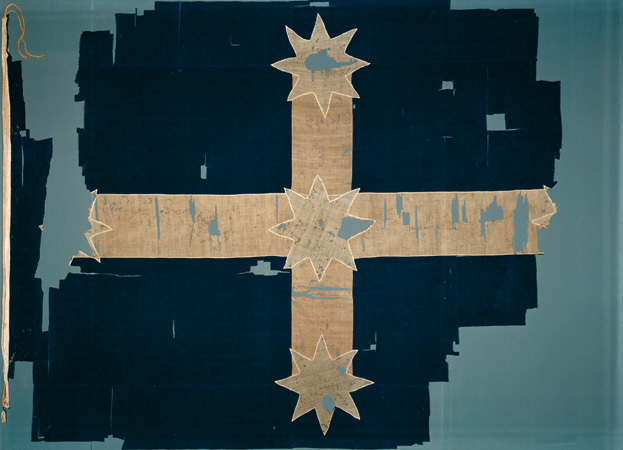 Throughout history flags have been markers of the ritual of revolution, and the Eureka flag was interpreted in this way when it was presented as Crown evidence at the trials in Melbourne where diggers captured at the Eureka Stockade were tried for the capital offence of treason against Queen Victoria. But from its very first appearance, observers made different interpretations of its symbolism. It was subsequently used by right and left wing political groups as a banner of dissent. That contest continues to the present day, with controversy over the proposal to raise the flag over the Australian Federal Parliament, and register it as a national flag. The intensity of these debates reveals much about our conception of nation, and our confused sense of national identity. Note: Rolling over a footnote number in this essay will display the footnote text. (Your browser's back arrow will return you to the main text). Flags were very important visual markers on the goldfields, used to identify the location of key buildings such as stores and public offices. From the beginning of the gold rush, and the first protests against the licence fee, flags would fly at public meetings. The artist David Tulloch sketched the scene at Mount Alexander in December 1851 where a diggers' flag was raised. In one corner was a pick and shovel, representing labour; in another was a bundle of Roman sticks, representing unity, in a third a set of scales, and in the forth the kangaroo and emu, representing an emerging Australian identity. This was a precursor to another diggers' flag, the Eureka flag, the banner of the Ballarat Reform League that emerged in Ballarat in early November 1854, seeking democratic reform of government and an end to the iniquitous and corrupt administration of the goldfields. In 1895 the President of the Ballarat Fine Art Gallery, James Oddie, obtained custodianship of the tattered Eureka flag, which had flown over the Eureka Stockade on the morning of 3 December 1854, when the diggers were attacked by Her Majesty's forces. Since 1894 it has been looked after by the Gallery, sometimes neglected, in recent times a treasured artefact of great importance. The treatment it has received at different times reflects the way people have valued it. For many years it was totally ignored, with very few people taking an interest in it. Today it is seen as a national icon and it is the centre of a number of disputes that I want to untangle. What did the Eureka flag stand for? What groups have used the flag? Should the flag become a national flag? What did the flag stand for? The first reference to the flag came in the Ballarat Times of Friday 24 November 1854, when an article alerted readers to the monster meeting of the Ballarat Reform League on the following Wednesday. It announced that at the meeting 'the Australian flag shall triumphantly wave, a symbol of Liberty'. With much colourful language, the report ends by urging the readers 'Forward! People! Forward!' It was very revolutionary, very emotive language, and the writer Henry Seekamp was obviously privy to the making of the flag. Collection: Art Gallery of Ballarat. The flag had been seen only briefly in public - first raised on Bakery Hill on 29 November 1854; last seen flying over the Eureka Stockade on the morning of 3 December 1854.
Who designed the Eureka Flag? However there is also a men's flag story, related by J.W. Wilson, that a group of men made the flag out of tent materials.13 A reliable eye-witness was A . W. Crowe who recounted in 1893 that 'it was Ross who gave the order for the insurgents' flag at Darton and Walker's'.14 Crowe's story is supported by advertisements in the Ballarat Times in October-November 1854 for Darton and Walker, tent, tarpaulin and flag makers at the Gravel Pits. As is the way of oral history, many have claimed a part in making the flag. The flag next appeared in Melbourne as Crown evidence at the Eureka trials in early 1855, when thirteen stockaders were tried for treason and acquitted. At the trial of John Manning, Trooper John King appeared as a Crown witness and he said 'I took a flag down. This (flag produced) is the flag. '18 It appears that nobody claimed the flag after the trials. Two days after the last defendants were found not guilty, Trooper John King resigned from the Victoria Police and took his flag as a trophy. John King became a farmer, eventually settling in the late 1870s near Minyip in the Victorian Wimmera district. Here the flag made occasional appearances at country bazaars. Withers commented in 1870 that he had not been able to find out what had happened to the flag. 20 It is likely that King read Withers's book, because he wrote to the Melbourne Public Library offering to sell the flag to that institution. The Librarian, Marcus Clarke, asked Peter Lalor for his opinion on the genuineness of the flag, but Lalor could not be certain, and asked 'Can you find someone whose memory is more accurate than mine'?21 The Library decided not to purchase the flag, on the grounds that there was some uncertainty as to its authenticity. In 1895 James Oddie, President of the Ballarat Fine Art Gallery, heard from a Methodist minister that the widow of John King had the original Eureka flag He wrote to Mrs King and asked her to donate it or loan it to the Gallery. Mrs King sent it to the Ballarat Gallery by post, wrapped in a brown paper parcel, on a loan basis. He discovered in his quest that a piece of cloth which Dr Alfred Carr received as a souvenir at the Camp immediately after the Stockade was in the possession of a local lady. Withers borrowed the fragment and took it to the Gallery so that the local manager of the woollen mill could test the two fabrics. He pronounced them identical, a telling point in establishing the authenticity of the King flag. This piece is now in the National Library of Australia. The kindly but misguided custodian at the Gallery continued this habit of giving small samples of the flag to interested visitors, almost as holy relics were distributed to pilgrims in Medieval times. Without realising it or articulating the sentiment, William Keith promoted the spirit of the flag and its symbolism. Keith was happy to help any people who demonstrated an interest in it, including members of the Communist Party. In the turbulent years of the 1930s, when economic depression and the rise of fascism dominated the public arena, the small Communist Party adopted Eureka as part of the history of workers' struggle against oppression. This policy led the Melbourne Artists' Branch of the CPA to want to make Eureka flags for the May Day March in 1938. One of the young artists, Evelyn Shaw, had grown up in Ballarat, and told the group that she had seen the original flag in the art gallery. She wrote to her mother to find out if the flag still existed, so that her friends could make an accurate reproduction of it for the May Day March. Mrs Shaw visited the gallery and talked to the custodian, who brought the flag out from the drawer where it was stored. He carefully tore off a small rectangle of blue cloth and gave it to the visitor. She then sent it to her daughter, enclosed in a letter describing the visit and containing a sketch of the design. Evelyn gave her mother's letter and the piece of fabric to Rem McClintock, the senior member of the art group.24 He was intrigued by the letter, and told his friend Len Fox about the flag. From 1963, probably resulting from Len Fox's interest, the Ballarat Gallery locked the flag away in a safe at the Public Library. On one occasion the librarian was horrified to discover that the safe had been broken into, but was mightily relieved to find the flag, in its brown paper wrapping, had been ignored by the robber. After this, the flag was placed in the vault of the National Bank. When the Gallery underwent extensions in 2001, assisted by a Commonwealth Centenary of Federation grant, the flag moved again, this time to its own gallery in the heart of the building, with improved lighting and a truly reverential place of honour. In September 2001, a legal process finally saw the flag given to the Gallery by the King family. In 1996 I was researching and writing a script for a video production on the flag, which led me to Sydney to meet and interview Evelyn Healy and Len Fox. When I asked Fox what had happened to the pieces given to him by Mr. Keith back in 1945, he admitted that he had been carefully looking after five tiny pieces, which he asked me to return to the Gallery. I did this with great pleasure in January 1997. I inquired from Mr Spielvogel, who has charge of, is responsible for, the Historical Museum here. He showed me a book by a man Raffaello written in 1855, 6 months after the Eureka riots. On the cover was a reproduction of the first flag I have drawn, which Mr S. feels certain is similar to the original. However, there has been quite a bit of controversy over the whole thing, as another flag, claimed by many to be the real one, is at the Art Gallery... I went to Mr Keith who produced it for me. It is a huge flag, hand-made (he said it was supposed to be made from the petticoats of the women, which it easily could be, as this material, which he tore off for me, is similar to what was used then. It is tattered, and also smothered with small holes, lots of which have a slight burnt edge. I would almost certainly say bullets had made them. Mr K. thinks it is the real flag. Mr S. said the original flag was silk, the Gallery one, bunting. However Mr K. says it is not bunting: I don't think I'd call it bunting. It has a silk texture and sheen. This set off a train of events, with the Ballarat Fine Art Gallery determined that the piece should not be auctioned, for the Eureka flag was too significant an artefact to be bartered over in the auction mart. Healy took out an injunction against the sale, on the grounds that the letter rightfully belonged to her. She had carefully kept copies of her mother's letters and was able to produce these as evidence that the handwriting in the 1938 letter was indeed her mother's. After lengthy legal proceedings, her claim was recognised. She presented the piece of the flag and her mother's letter to the Ballarat Fine Art Gallery in March 1998. In the Gallery's new Eureka Gallery, these pieces are displayed near the flag, with their stories. The early years of the 1890s saw the rise of the labour movement, with a number of trade union-led strikes, and derivatives of the Eureka flag appeared as a banner of trade union solidarity and protest against capitalists who would not negotiate a fair deal. At the trysting ground of political protest in Melbourne, the Yarra Bank, 30,000 people gathered in August 1890 under a platform decorated with the Eureka flag to demonstrate union solidarity with maritime workers.36 The protesting shearers at Barcaldine, Queensland in April 1891 were reported to have flown a Eureka flag over their camp. Henry Lawson wrote his famous poem Blood on the Wattle about the incident. 37 This poem, more than anything else, has, I believe, been responsible for the trade union movement's love affair with the flag. Coloured by the events of World War One and the Great Depression, the Eureka flag made a reappearance in the public domain during the 1930s. The right-wing nationalist New Guard adopted it,40 and it was also adopted by the radical left wing of the Australian Labor Party and the Communist Party. 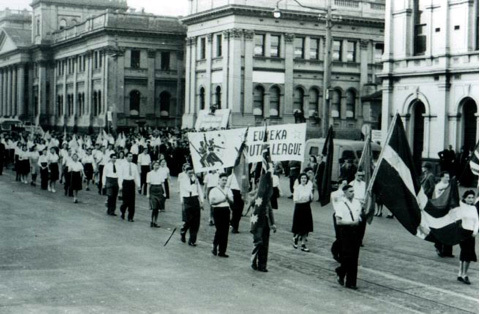 I have earlier described the CPA's use of the flag at May Day marches from the 1940s.41 The most notable Communist group to use the flag as its symbol was the Eureka Youth League, formed in Melbourne in 1941. May Day march, Melbourne, 1945. EYL members carry their Eureka Flag. From the 1960s the flag became strongly associated with the Builders' Labourers Federation, used by Jack Munday in Sydney and Norm Gallagher in Melbourne, with Eureka flags being carried at militant trade union demonstrations. Union members also wore the flag on their hard hats and tee-shirts, making it a popular item of personal clothing. While people knew little about the historical origins of the flag, it was readily identified as the symbol of the militant wing of the trade union movement. Following the demise of the Builders' Labourers Union, it was taken up by the Electrical Trades' Union and the Construction, Forestry, Mining and Energy Union. Many other groups have also used the flag, their motivations sometimes difficult to understand. For many years the Minerals Council of Australia used to celebrate the Eureka anniversary at its headquarters in Canberra, draping the foyer of their building with Eureka flags. This provided a spectacular foil to the trade unions, but the Council venerated Eureka because the miners objected to an unfair gold licence which they saw as an unwarranted intrusion upon free enterprise. In a similar way the Small Business Association staged a rally of 6000 people at the Stockade monument in 1990, waving Eureka flags as a protest against Federal taxes.56 It is more difficult to understand the interest of bikies in the flag, but the Eureka Centre gift shop in Ballarat reported that bikies were the best customers, buying flags to fly from their motor bikes, and especially silver belt buckles which incorporate the Eureka flag. The Ballarat Fine Art Gallery has looked after the flag for over 100 years, on behalf of the Australian people. The Gallery is able to give the best possible conservation to this precious and beautiful national icon, close to the site where it first flew at Bakery Hill as a symbol of protest. Whether that protest represented the spirit of democracy, or republicanism, or free enterprise has been disputed. Who was responsible for the design of the symbol, for making it, and whether the flag in the Ballarat Fine Art Gallery is the genuine article are questions that have generated heated arguments. At the end of the twentieth century, a lively contest has arisen about the appropriate location of the flag, and about whether it should become the Australian national flag. Meanwhile the Ballarat Fine Art Gallery cherishes the flag in its special shrine, where it has displaced the Union Jack that once marked the locality as a British colony. The beautiful, stark and simple design of the flag had been the basis of its enduring appeal, endearing it to the diverse array of organisations who have adopted it as their symbol of unity, passion and Australia's heritage. There is still much work to be done in clarifying our national identity, but in looking back over 150 years, there is no doubt that the Eureka flag has become the most important symbol of that identity. 27	Austin McCallum, The Eureka Flag, Ballarat Fine Art Gallery. 1973:Len Fox, Eureka and its Flag, Canterbury, Vic., Myllaya, 1973. This was updated again in 1992 as The Eureka Flag, with a contribution by Val D'Angri, Potts Point, NSW, the author, 1992. 28	The Stars and Stripes web site is maintained by the National Museum of American History, Smithsonian Institute at http://americanhistory.si.edu/ssb. I am grateful to Lonnie Bunch, Associate Director for Curatorial Affairs, at the Smithsonian for sending me information about the conservation program. 32	Bulletin, 28 April, 1998, pp. 26-7. Also my conversations with Evelyn Healy. 36	Fox, The Strange Story of the Eureka Flag, p. 17: W.A. Spence, Australia's Awakening, p. 95., who describes the meeting on Sunday 31 August 1890. E.J. Holloway, writing in the Sydney Daily Telegraph, 14 March 1963, said that the platform on 29 August was decorated with the Eureka flag. 47	Letter from Audrey Blake to author, 20 May 1997. Also Audrey Blake, Notes on the Development of the Eureka Youth League and its Predecessors unpublished, copy in Eureka Youth League collection, University of Melbourne Archives. 51	Drew Cottle 'Eureka - a rebel flag for our troubled times', Southern Cross, newspaper of the Australian Independence Movement, Sydney, March/April 1984, p. 1,10. See also 'Australian Independence Movement' file in the Riley Collection, La Trobe Library. 53	Michael Willis and Geoffrey Gold 'Eureka, Our Heritage' in Geoffrey Gold (ed. ), Eureka; Rebellion beneath the Southern Cross, Adelaide, Rigby, 1977, p. 101-108: Les Murray, 'The Flag Rave', The Peasant Mandarin, St. Lucia, University of Queensland Press, 1978, pp 230-244. Poet Murray published this prose piece in the Nation Review in 1977, and sees the sacking of the Whitlam government in 1975 as a time when Republican sentiment gathered strength, and the Eureka flag was re-invigorated as a national, and republican, symbol.